Why do government offices still close at lunch despite “no noon break” policy? We are all still reeling from yesterday’s state of the nation address, which by the way, was delayed for more than an hour, a first in the history of SONAs. However, that is not the only first that President Rodrigo Duterte’s SONA achieved. For the first time since assuming the presidency, Duterte did not go off-script or curse. He stuck with the original speech, only occasionally inserting some Filipino lines (without cursing, thankfully), and went on to finish his speech in 47 minutes—17 minutes shy of the shortest SONA speech delivered by former president (and now House Speaker) Gloria Macapagal Arroyo in 2005. And speaking of GMA, one of the president’s talking points was about abolishing corruption in the government—not only among his ranks but also in lower government office especially those on the service front. 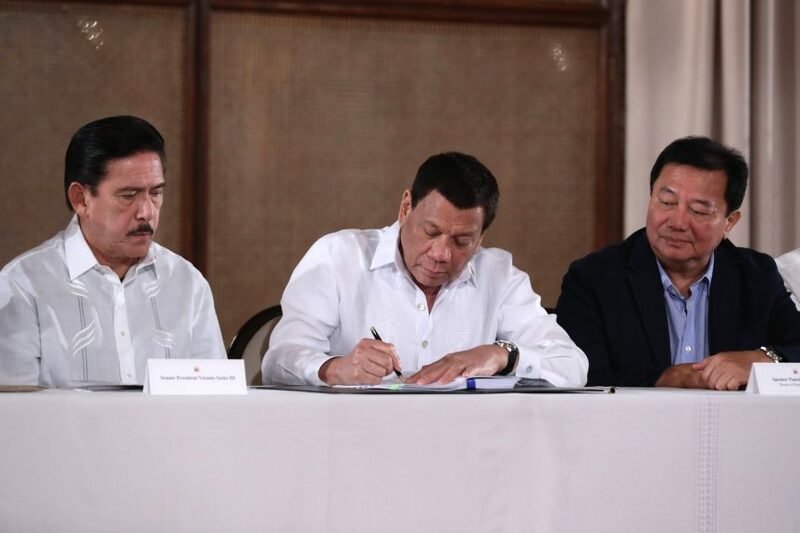 “While we run after those who steal the people’s money, we are also enhancing the government’s delivery of frontline services,” Duterte said before lauding the Congress for passing Republic Act No. 11032 or the Ease of Doing Business Act which amended the Anti-Red Tape Act of 2007 (ARTA). The president called onto government officials and employees to “make their services truly customer-friendly.” “Our people deserve efficient, effective, and responsive government services. They deserve nothing less. Kayo lang ang ayaw eh. Gusto ng tao kayo ‘yung binabayaran, make your living from the pockets of the people and you have a lousy and corrupt bureaucracy,” he said in one of the very few occasions during his speech where he ad-libbed. Republic Act No. 11032 or the Ease of Doing Business Act was signed into law on May 28. The law amended ARTA and effectively reduces the processing time for all government transactions done by civilians in all government agencies and entities to three working days for simple transactions, seven days for complex transactions, and 20 working days for highly technical transactions. “This law will introduce simplified requirements and streamlined procedures that will finally spare our people from the intolerable waiting time and long lines in frontline government agencies,” Duterte said in his speech. Section 8 (e) of ARTA reiterated in Section 21 (f) of the Ease of Doing Business Act, requires heads of offices and agencies which render frontline services to adopt working schedules which will ensure that all clients are attended to and served before the end of the day even during lunch break. 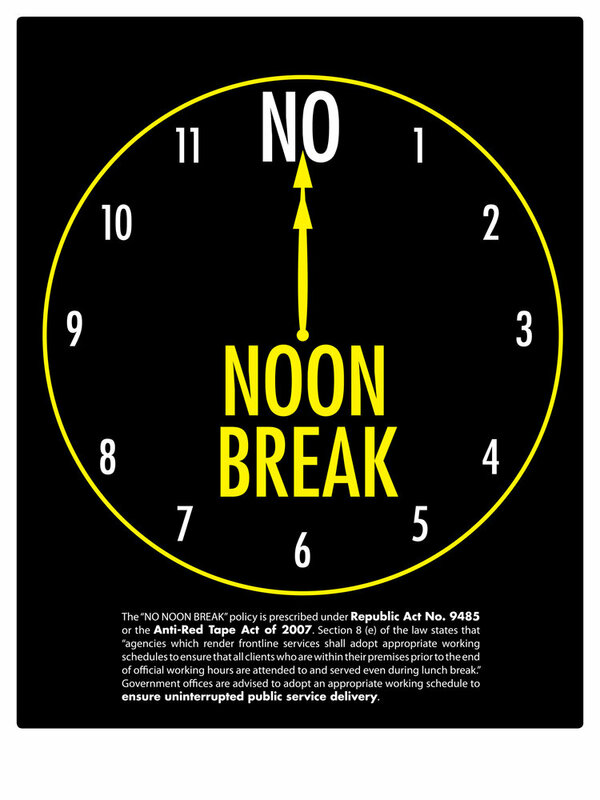 Since its implementation, all government transaction windows were required to post a sign outside which by now we are all familiar with, of an analog clock and the words “NO NOON BREAK” imprinted on it. However, as with any other laws, the effectiveness of such measure is wholly subjective. Filipinos are still subjected to long lines when transacting at government offices, and worse, despite the no noon break policy, made to wait until the resumption of office after lunch. By the way I got to DFA Megamall at 12nn yday and the guard gave me a stub that said “2PM” tapos balik nalang daw ako kasi next slot is 2PM na. “Ikot na muna kayo sa mall.” I said “Ummmm can I talk to someone in charge?” Lunch breaks are not allowed. This is the reality most Filipinos are still experiencing. Even some personalities are not exempt from this, as celebrity mom Saab Magalona learned. Magalona visited a Department of Foreign Affairs satellite office in a mall in Mandaluyong to get her baby a passport on Jul. 17. She arrived at 12 noon and to her surprise was told by the guard to return at 2 p.m. after giving her a stub. Knowing that all government offices must adopt a no noon break policy, Magalona asked why she was told to return when lunch breaks are prohibited. After much prodding, she was eventually let inside where she was greeted by an officer who told her, “Kahit mga naka-wheelchair po, 2 p.m. na namin pinabalik.” And true enough, she saw that no one, not even PWDs, seniors citizens or pregnant women, were in the designated priority lane. So why do some government offices still close operations during lunch break despite the passage of the Ease of Doing Business Act? For one, the original provision in ARTA does not bar people manning the frontlines from taking a lunch break much less from eating lunch at a reasonable time, per se. It only mandates that offices adopt a working schedule which will allow them to still attend to clients even during lunchtime. The implementation of policy also depends on the strategy of management and staff of the concerned offices, as this article from the Philippine Information Agency proposes. Then civil service commissioner Francis T. Duque also clarified that the no noon break policy does not mean the officers do not get to have lunch. “Ibig sabihin, kakain nang mas maaga. Basta may maiiwan sa front desk,” Duque clarified in a radio interview. The Ease of Doing Business Act, not only added new provisions to ARTA but also removed grave penalties for violation of the no noon break policy, which is considered to be a light offense. Prior to RA 11032, third offense is subjected to dismissal and perpetual disqualification from public service, but now failure to attend to clients who are within the premises of the office or agency during lunch is met with only an administrative liability with six (6) months suspension. Heavier penalties under the new ARTA are reserved for those who meddle with fixing. One cannot help but ask given these realities: Is the new law Duterte lauded the Congress for really meant to ease waiting time and long lines or to ease these government offices of liability? RECAP: What has Duterte done since his last SONA?